DAX IMMO™ is a business empowering system for Real-Estate market oriented companies that provides flexibility, responsiveness and mobility. Various insight to data is also provided, all in order to reduce time needed to reach potential targets and goals. DAX IMMO™ adapts to the needs of the users, and to the changing business climate to offer best support for Real-Estate trading companies and Property Management companies with big market expansion, providing services to a limitless number of clients. DAX IMMO™ also adapts to the market regulations and covers all processes dependent on the country that the business is located, and also offers multi-country coverage. Using DAX IMMO™ provides overview in the efficiency and tracks the company progress in order to ever improve and tackle the global market. 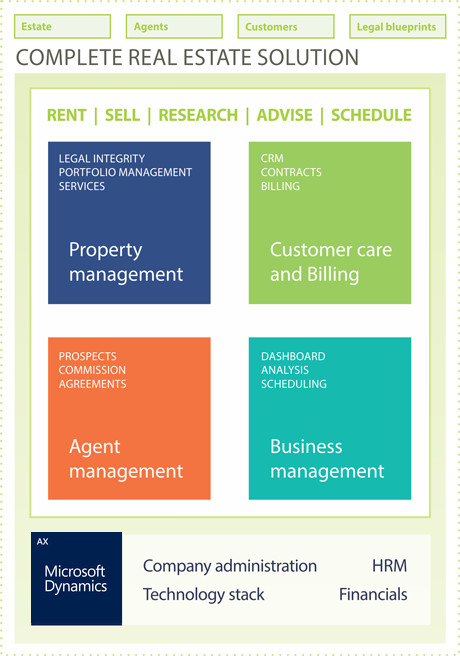 DAX IMMO™ is powered by Microsoft Dynamics AX, and is the best Real Estate market oriented AX solution on the globe. DAX IMMO™ is developed according to Microsoft's highest standards and follows Microsoft's latest trends and best practices. DAX IMMO™ offers unique chance to bring new energy to your company by empowering it with a innovative solution specially developed to provide maximum support in every field of the business. Having the first complete solution of its kind is a big step forward to outsmarting the competition. Following worldwide trends the Microsoft Dynamics AX is hosted on the cloud using Azure. Similarly all the products that make up DAX IMMO™ are cloud hosted. That way the resources needed for this solution are reduced as well as the costs. DAX IMMO™ is developed by the EVER-NEAR team. All round experience with a big span of ICT knowledge and technologies, as well as real estate market oriented background, covering all the possible fields in which the market could and would expand, to meet every specific need that the client expects from their software solution. Working toward providing the client with a complete tailored solution that is ready to tackle the global market. Contact us without any hesitation, we would really love to answer any questions you might have! Just drop us a note using the form on the right or the contact info below, thank you! Copyright © 2019 DAXIMMO. All Rights Reserved.